This is Part 2 in a series of posts from 45 Drives co-founder Doug Milburn, reflecting on the evolution of 45 Drives, where we’re headed and why. Read Part 1 to find out how 45 Drives got its start, with help from Backblaze. The original Backblaze Storage Pods were designed around port multiplier backplanes. These are circuit boards that have multiple SATA hard drive connectors (5, in this case), and one SATA cable connector. This allows up to 5 hard drives to be plugged into the board, and multiplexed and sent through 1 cable to a shared SATA port. Therefore, 45 drives require only 9 cables and SATA ports. This is economical as well as practical. 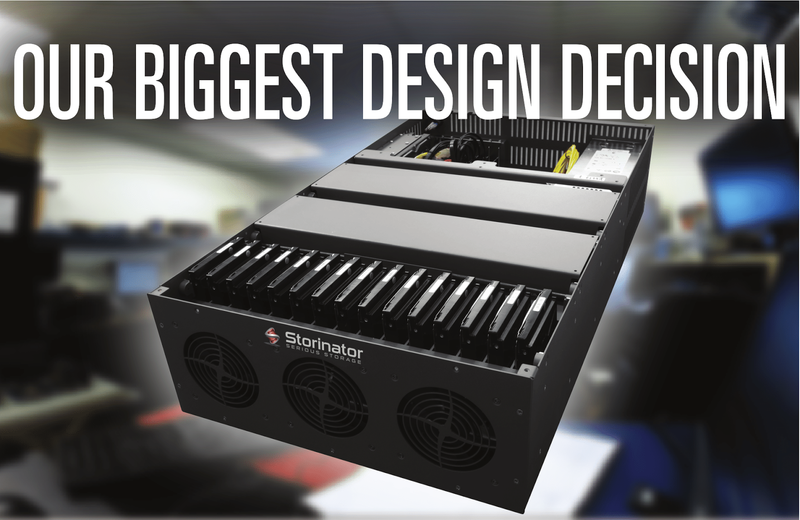 Combined with Backblaze's vertical mounting, this was a brilliant design. There are a few restrictions and caveats, of course. The SATA adaptors must be chipset compatible with the backplane port multipliers, and drivers are required. Physical dimensions of 5 port boards follow a defacto standard. Also, data for 5 drives shares 1 SATA cable (3Gbit in the original design), limiting performance to 60 MBytes per second per drive (whereas mechanical drives can transfer approximately 150 MBytes per second). But all things considered, limited throughput speed was a reasonable sacrifice for Backblaze, and backplanes were what drove the success of Pods 1.0 to 3.0. Backblaze has operated their business successfully for years now, mostly with backplane machines. But we experienced a number of challenges when we sold these to the larger storage community. At 45 Drives, it is in our nature to get to know our customers and what they are doing (or want to do) with their pod. And we really can't help thinking about variations to the design, and how it might improve the pod for various applications. Because we are part of Protocase, a mass customizer and the fastest low-volume metal manufacturer on earth, evolving the design was an inevitable step for us and continues to be an ongoing endeavour. It's what we do. Over the years, we have listened to feedback from hundreds of very bright people involved in a wide variety of applications. In addition to the standard pod designs, we have built a large number of customized pods (in fact, we end up customizing almost 50 per cent of pods to some degree). 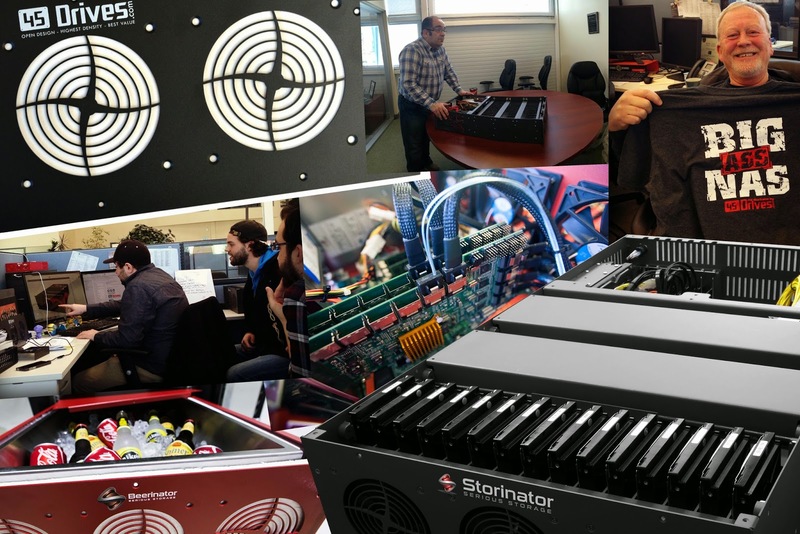 Over the last couple of months, everyone at 45 Drives has been totally immersed in work related to “launching” the new Storinator models that just went up on our site last Friday. I put quotes around "launch" because it's not really a conventional product launch, because these new products have been built and sold for some time. In fact, just like the original large storage pods from Backblaze, they were built and used by clients of ours on a custom basis, and we've been quietly selling them in soft-launch for some time. After our website went up late last week, we had some time to reflect on where we are, and we thought there were some interesting stories to tell about how large storage pods and the storage community created 45 Drives, and how we've been a conduit for the evolution of large storage pods. I'm writing this because I believe that some will find this story relevant and interesting, and maybe inspire others to develop their ideas to reshape and refine their own areas of computing, just like our friends at Backblaze reshaped large storage. Back around 2002, my friend and now business partner Steve Lilley and I founded Protocase, 45 Drives' parent company. Steve is a mechanical engineer who had worked his career in the electronics industry, eventually becoming VP Ops of a company that built electronics for marine navigation before working with me on various freelance technology projects. Protocase was born of the frustration that Steve, I and other colleagues experienced when we tried to buy custom electronic enclosures. The 'engineering quantities' that we needed weren't of interest to the larger, more sophisticated players, and the small shops who would take our jobs would bump us to the back of the lineup if larger orders came in. The rest is history – we were correct assuming that others felt our pain, and we've built a wonderful niche business by building enclosures, sheet metal parts, and, most recently, machined parts, for scientists and engineers across North America and around the world. One particularly fascinating customer was Backblaze. This Silicon Valley-based startup was in the process of refining and implementing their vision of reinventing storage, and was feeling the same pain that Steve and I felt. We were fortunate that they stumbled on us, beginning a long and productive relationship. Protocase's design services and rapid mass-custom manufacturing allowed Tim Nufire and his staff to turn their ideas into physical reality. Through inspired design, hard work and multiple iterations, their thoughts were refined into the Large Storage Pod design that is the foundation of their business. (If you don't know about them, check them out at www.backblaze.com, they sell unlimited backup for your computer for $5/mo. via an internet connection and a brilliant little utility that buzzes away in the background. It doesn't slow your computer, and your data is always secure). Welcome to the NEW 45Drives.com Blog! Cameron MacDonald here for 45 Drives, and on behalf of the entire team, I'd like to welcome you to the new 45 Drives Blog! And, of course, you'll meet the team who are on the forefront of the technology sector and the guys who are continuously developing new methods to maximize performance to meet your needs! So stay tuned here on the 45 Drives Blog for exciting news and announcements you won't want to miss. Have a suggestion for something you'd like to see here on the blog? Let us know in the comments!